In this day when visual images often hold more sway than the spoken word, we ought to pay attention to a spiritual practice that focuses on image: visio divina (divine vision). The same four movements that are found in lectio divina (divine word) are used in visio divina. The difference is that you work with an image, a piece of art, rather than a biblical text. Having no background in art or art appreciation, I came to the use of art in Christian formation and in spiritual practices first when I was an editor for The Inviting Word, curriculum resources that used extant art to gain new insights into the lectionary texts each week. Selecting the art and working with it to write or edit the session plans for all ages was a life-changing experience for me (and many others). The beautiful coffee table books—Imaging the Word, Volumes 1, 2, and 3—with reproductions of the art—religious, contemporary, abstract, still life, landscape—were a joy to behold and just right for personal visio divina. My faith grew by leaps and bounds through these experiences. But the best way to understand a practice is to do it. Find a piece of art, something with depth and substance. For the first time, you might want an art piece that depicts a biblical scene, but it doesn’t have to be overtly religious in content. Place the art work where you can see it easily. Movement 1: Seeing Gaze at the art work, taking it all in. Notice the contrast of the dark and light colors. What message do you get from the colors, the shapes, the arrangement of people or objects? Does it convey movement or is it quiet? What is the focus point? What is the art work as a whole saying to you? Try to look at it as a whole, without boring in on one aspect of it. Movement 2: Meditation Turn away from the art work for a moment. When you look at it again, where do your eyes alight first? What piece of the art work draws your immediate attention? What is it about this part of the art work that draws you in? Gaze just at that part of the art work and let your mind dwell on it to ponder it and consider its meaning for you. How might it be revealing God to you? How do you dwell in this art work, particularly in the part of it that has drawn your attention? Movement 3: Oration In this movement, you pray. Let your prayer come naturally from the part of the art work on which you have been meditating. If it is a glorious tree, pray for God’s creation and our role as stewards of it. If it is a child or a family, pray for your own family, families you know, and families around the world. 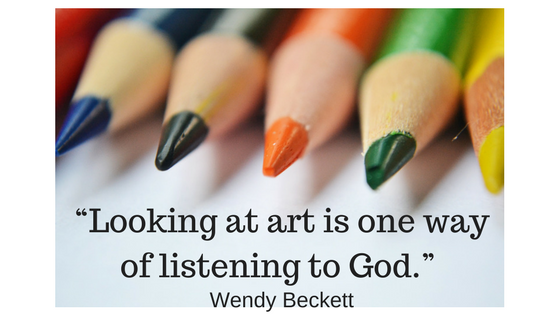 If you have been gazing at abstract art, it might prompt you to pray for creativity and the freedom to create. Movement 4: Contemplation Now that you have “worked” with this art piece through seeing, meditating, and praying, relax in it. Just sit with it. Glory in it. Empty yourself as much as you can to allow the Spirit to come to you through the art work so that you can rest in God for a moment. During visio divina, stories or verses from Scripture may come to you. Use them to help you enter into the process. Note them to use later or another time as lectio divina. Visio divina can be used with all ages and all abilities because reading is not necessary. I have heard that someone who is sight-impaired can participate in visio divina when the art work can be touched, such as a sculpture. Art works can be found anyway. Pick up post cards at an art museum. Scour used book stores for art books. Purchase calendars at half-price after the first of the year. Save the back page of Christian Century magazine, which always features one art piece and the style and content varies widely from month to month. If you are fortunate enough to have any books about or cards with art from The St. John’s Bible, the gloriously illustrated Bible sponsored by the Order of St. Benedict in Collegeville, WI, you will surely want to use them for visio divina. You can learn more about The St. John’s Bible and ways to use visio divina at their website www.seeingtheword.org. Carol Wehrheim is a member of the ADVOCATE Ministry Team. She is clerk of session at Nassau Presbyterian Church, Princeton, NJ and can be reached at [email protected].